Sometimes, it’s hard to identify what makes a game worthwhile. The enigmatic appeal of dying a thousand times playing Super Meat Boy, for example, should prove alien to anyone who hasn’t spent time in and around its world – especially when it’s held up against its bigger, more forgiving brother, Mario. 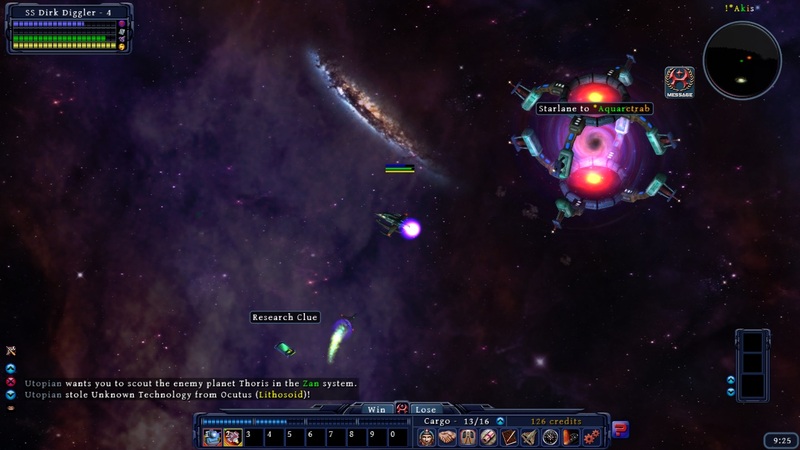 In a similar vein, at first glance, Drox Operative is nothing more than Diablo in space, an ARPG made interstellar, complete with an isometric viewpoint and an emphasis on filling your cheeks with as much loot as possible. It’s fundamentally familiar, a fact that works in the game’s favour given the bumps of its indie presentation, but one that also brings to mind the image of a little brother desperately trying to imitate big brother’s walk. While comparisons to the recent resurgence of the genre in Diablo III and Torchlight 2 aren’t too offensive, they also do little to describe the idiosyncrasies that make this sibling so special. So yes, you click on things a lot in this game, and while Drox Operative falls into the genre’s trappings in so much that it’ll put you at severe risk of RSI, it also innovates enough within those constraints that it jumps ahead of its peers, for both better and worse. 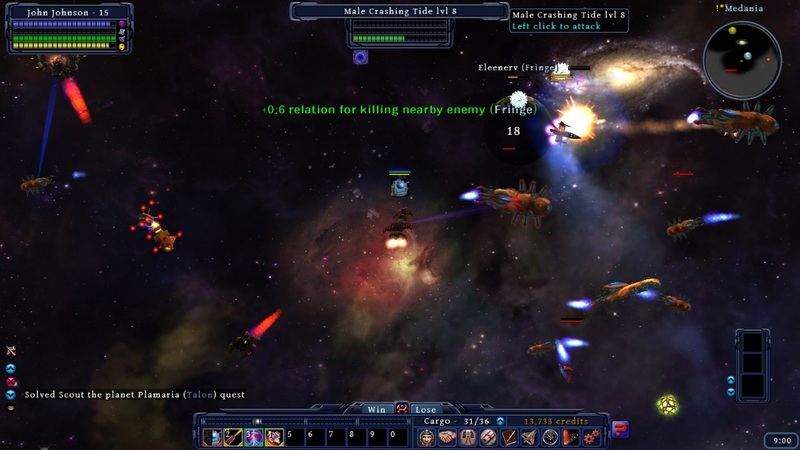 In Drox Operative, you’re given free reign over the basic parameters of your play environment (how big it is, how fast it moves, how difficult the squishy enemy mobs will be) and dropped head-first into a game that, again, should seem familiar enough to anyone who’s come into contact with Diablo and its ilk. 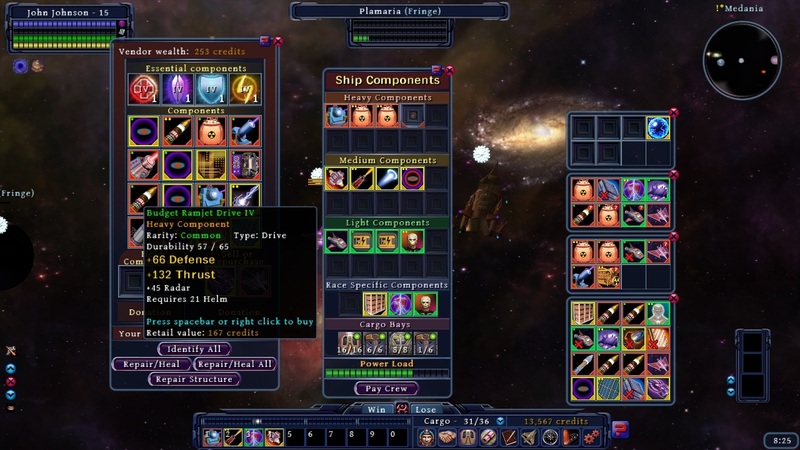 Clicking on enemies launches attacks, clicking on the stuff they drop puts it into your inventory, and beyond that, you can level up, equip yourself with all manners of fancy weaponry, and run errands for anyone in the galaxy who might happen to need their shopping picked up. Of course, then you discover the ‘relationships’ icon sitting at the bottom of the screen, and it becomes clear exactly what makes Drox Operative so different. In short, the goal in Drox Operative isn’t necessarily to destroy some big evil space-beast, or even to earn a future for your self-styled mercenary, but instead to play the third wheel in a metagame of galactic politics. As a representative of the Drox, you’re (true enough to the game’s title) simply encouraged to operate towards your guild’s interests. Morality has no say in events, and neither does the power of your ship as an individual entity; you’re simply trying to win a galaxy-wide willy-waving contest for the unspoken leaders back at HQ. As long as you can prove that the Drox are a vital component of your system’s power-structure, you’re winning. Essentially, you’re playing Civilization from the ground-level, letting the bigwig AI go about their business and stopping to intervene where best meets your interest. 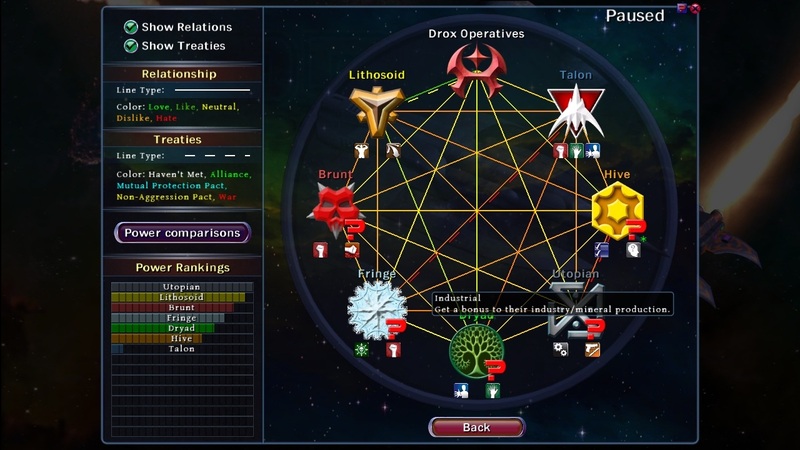 As a result, the aforementioned ‘relationships’ screen is an integral part of the game; whether you choose to play as a Diablo-esque lone-wolf, or find yourself privy to the backroom politics of propaganda and deception, everything you do affects the balance between the factions to some extent. It may not be pretty, but the relationship screen is probably one of the game’s more intuitive features. 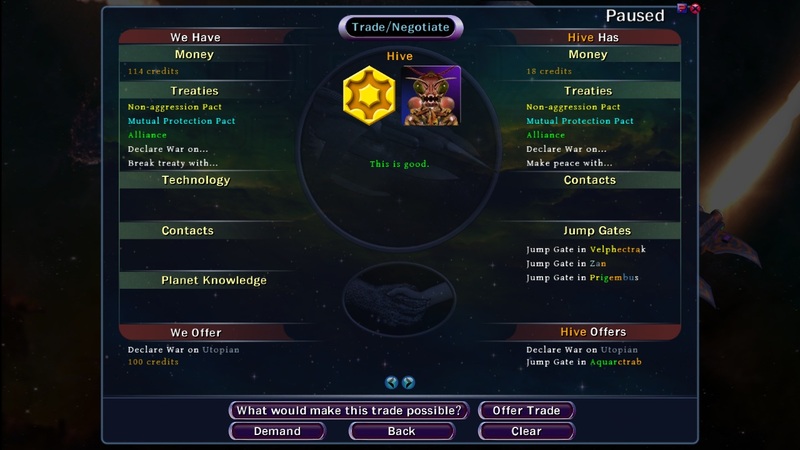 For example, gain enough favour with a faction, or simply withhold enough valuable information from them, and you might gain enough leverage to persuade them to go to war, or to sign treaties that would otherwise seem unthinkable. Play well enough, and you can pull the strings for almost every faction in the galaxy, influencing the flow of money and power all the way to the top. For me, Drox Operative proves best when it hits this sweet spot, and plays up to the power fantasy that it’s tutorial language suggests, allowing its player to operate as the wildcard in a vast landscape of galactic warfare. Unless you actively go out of your way to generate a galaxy that bows to your every whim, you’ll never be the toughest ship in the galaxy, or even necessarily the smartest player; and it’s only through the tactical application of your chosen talents that you can succeed. If anything, it’s refreshing to play a game where you aren’t the best at everything; in Drox Operative, knowing your limits is perhaps one of the strongest virtues you can hold. Although one question I’ve always been interested in with regards to videogames is that of the dwindling flame: is it better for a game to burn out or be extinguished? On the latter end of the scale, we have the likes of Shenmue – games so egregiously short-lived that you can’t help but be angry when the credits are thrown in your face – and here, Drox Operative proves the complete opposite; the long burn that far outstays its welcome. After forty hours, I’m content to say that I probably won’t spend much more time on Drox Operative. There are systems in place designed to lend a sense of place to every skirmish, and persistence between different games is an interesting idea that the likes of Civilization would probably do well to follow, but ultimately, it’s all one big case of diminishing returns. Out of a possible one-hundred levels, my ship climbed the ranks up to around thirty, and had to call it a day. It’s a problem that I’ve run into a lot as of late – with Skyrim, in particular, I stuck around long enough that my increasing over-familiarity with the game’s systems ostensibly soiled everything that had come before, and I find it hard to talk about that game with any degree of reverence these days, even though I know that there was a period of around one hundred hours where I was completely smitten. Likewise, I find it hard to praise Drox Operative now that I’ve played through to my own bitter end; the amount of content here only supports around thirty hours with any degree of comfort, and then you just have to hope you’re wise enough to know when to call it quits. Admittedly, it’s a personal niggle, but one in a long laundry list of niggles all bred of the same complaint: Drox Operative seems to be designed against – rather than for – its player. The game’s aforementioned persistent aspects, for example, are the device that kept me coming back to the bitter end, and for no foreseeable end or purpose. It seems that there are too many systems in place simply for the sake of it, with no regards to how the player will want to use them. Arbitrary equipment and speed limits turn the first ten or so hours into an awkward grind, and AI behaviour, while impressive on a small scale, only proves unwieldy when it matters – when you’re actually trying to make a difference. It all proves a bit too blatant an abuse of the ‘carrot/stick’ tactic, keeping you hooked under the belief that things will fall into place and get better if you just gain a few more levels or start another skirmish, when in actuality, they won’t. Does this mean Drox Operative is a bad game? Not at all. Frustrating? Absolutely. Through its refusal to cater to the wants of its player, Drox Operative can produce some compelling underdog narratives, and antithetical as it may seem to a good time, it can really capture the spirit of a fight against overwhelming odds. If you lose, however, expect to hate the game for it. Coaxing an AI partner into clear victory only for them to turn around and botch your plans at the last minute will never cease to annoy. If one thing becomes clear, it’s that Drox Operative is a successful experiment with the boundaries of genre, held back only by the loftier sides of its ambition and the clear constraints of independent development. If anything it’s opened my eyes to developer, Soldak Entertainment (who as it turns out have been at this for a while), but that long-lasting appeal still remains something of a mystery. You may hate it and love it all within the space of the same skirmish, but that’s the beauty of Drox Operative. When the pieces fall into place, the battles are epic, the narratives are deliciously complicated, and the difficulty strikes a Goldilocks blend of just right; it’s just a case of learning to keep the game at arm’s length until that happens. You can buy Drox Operative from Soldak’s website here, or support a potential release on Steam through the Greenlight page here. This entry was posted in Videogames and tagged Civilization, Diablo, Drox Operative, Indie, review, RPG, strategy, videogames. Bookmark the permalink.